Champon (ち ゃ ん ぽ ん?) 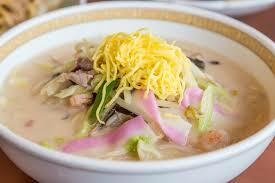 (Chanpon) or Nagasaki champon is a typical noodle stew of Nagasaki city. Champon is a development of Chinese-style boiled noodles. Ingredients of pork, seasonal seafood, kamaboko, and vegetables (cabbage, bean sprouts) sauteed with lard. Broth from a mixture of pig bones or chicken bones is added to boil the noodles until tender. In Korea a champon-like cuisine is called Jjamppong (짬뽕), and cooked with the addition of chili. In Okinawa, champon means a plate of rice with side dishes on it.